Hundreds of thousands of people have taken to the streets of Brazil demanding justice in the face of sporting austerity. I traveled to Brazil last September to investigate preparations for the 2014 World Cup and 2016 Olympics. It was painfully evident that the social disruption of hosting two mega-events in rapid succession would be profound. Everyone with whom I spoke in the community of social movements agreed that these sports extravaganzas were going to leave major collateral damage. Everyone agreed that the spending priorities for stadiums, security and all attendant infrastructure were monstrous given the health and education needs of the Brazilian people. Everyone agreed that the deficits incurred would be balanced on the backs of workers and the poor. What people disagreed upon was whether anybody would do anything about it. Most argued that the country had become too apathetic. After six years of economic growth, which followed thirty years of stagnation, people were too content to protest. The ruling Worker’s Party was generally popular and as soon as the countdown to the World Cup actually began, all anger would be washed away in a sea of green, yellow and blue flags bearing the country’s slogan, “Order and progress.” Others argued that statistics showing rising wealth and general quiescence actually masked a much deeper discontent. As Professor Marcos Alvido said to me, “Statistics are like a mankini [a Brazilian speedo that men wear]. They show so much but they hide the most important part.” That “most important part” was the analysis that Brazil was simmering and the lid could stay on the pot for only so long. The pot has officially boiled over as hundreds of thousands of people marched in at least ten cities this week. The financial capital of São Paulo was brought to a standstill. The political capital, Brasília, saw protesters climb onto the roof of the National Congress building. In Rio, several thousand marched on legendary Maracaña Stadium, the epicenter of the 2016 Summer Olympics, at the start of the Confederations Cup. As fans cheered inside, there were gassings and beatings on the outside. While sports journalists recorded the action on the field, reporters in the streets were shot with rubber bullets, and are now alleging that they were targeted. This protest eruption has been referred to as the “salad uprising” after a journalist was arrested for having vinegar in his backpack (vinegar is a way to ward off the worst effects of tear gas.) Now vinegar is carried openly and in solidarity. It’s also, given the expansive use of tear gas, quite useful. There are numerous factors driving people into the streets, but the back-breaking piece of straw that crystallized all discontent was a twenty-cent fare hike for public transportation. The country is investing billions in tourist-centric infrastructure and paying for it by bleeding out workers on their daily commute. It was too much. 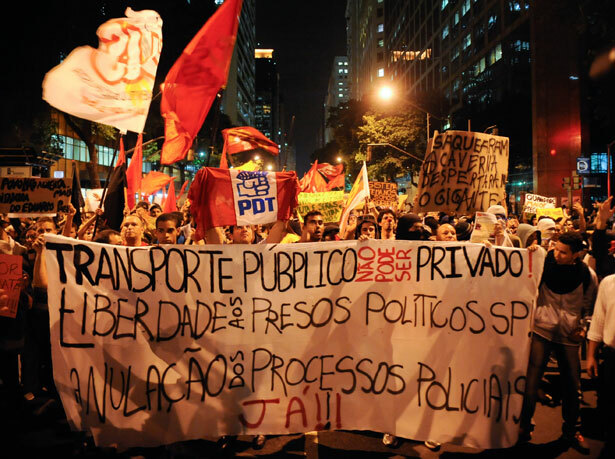 Nevertheless, the protests are gaining energy and are finding voice among the Brazilian diaspora throughout the world. Over 300 people marched in New York City on Monday with signs that read, “Olympics: $33 billion. World Cup: $26 billion. Minimum Wage: $674 [about $320 a month in US dollars]. Do you still think it’s about 20 cents?” There have also been reported protests in France, Ireland, and Canada. This isn’t a movement against sports. It’s against the use of sports as a neoliberal Trojan horse. It’s a movement against sports as a cudgel of austerity. It’s a movement that demands our support. Until there is justice, we are all salad revolutionaries. Dave Zirin writes about the unprecendented corruption that is fueling development for Putin’s Winter Olympics.